It was the firm belief of the nineteenth century mystic and sensitive, Helene Blavatsky, that there had existed in the ancient, prehistoric world a 'Secret Doctrine' which constituted what she held to be the 'universally diffused religion' of that time. Furthermore, she forecast that, in the twentieth century of our era, scholars would begin to recognise that this Doctrine had neither been invented, nor exaggerated, but that its teaching reached back millennia to antedate the Vedas. Certainly, her belief accords with our own researches. in the Secrets of Enoch, from which we have quoted widely, the Lord of Spirits is recorded as having initiated what may have been the documentation of such a doctrine, at a time close to 7200 BC. [SE XXII:12 PP] Then the Lord called one of his Archangels named Uriel (Enki), who was the most learned of them all, and said: 'Bring out the books from my library, and give Enoch a pen for speedy writing, and tell him what the books are about: And Uriel hurried and brought me the books, smelling of myrrh, and handed me a pen. Whether Enoch made a copy of the books, or whether he took notes for his own use, we do not know. It is even conceivable that he might have translated them from erne-an into the language of his own people. What we do know, however, is that many years later, when he returned to his family in the Lowlands, he took with him a number of books which he handed to his son, Methusaleh, with the instruction that he should study its lore and, ultimately, pass it on to his children for the benefit of future generations of the Patriarchal line. [EN LXXXII:l VB] And now, my son Methuselah, all these things I am recounting to thee and writing down for thee, and I have revealed to thee everything, and given thee books concerning all these; so preserve, my son Methusaleh, the books from thy father's hand, and [see] that thou deliver them to the generations of the world. These books have been lost, and no trace of their existence remains today. And it may, or may not, be of significance that Methusaleh died in the same year as the Flood occurred. If it is not of significance, then the books may have been carried in the Ark by Noah and subsequently lost or destroyed. But, because of the loss, traditional teaching of what were to become esoteric truths came to be by word of mouth; and the learning of these truths by rote - until men, once more, committed them to writing. In the early days of man's development, the natural disseminators of all forms of learning were the Shining Ones. After the First Diaspora, they spread their knowledge widely throughout the Middle East, but this knowledge appears to have been confined to practical issues - writing, observational astronomy, simple mathematics, agriculture, building and crafts. 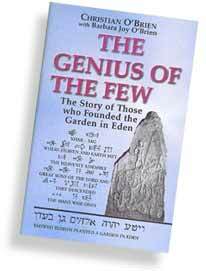 No spiritual instruction is known to have survived from this remote period of 7,000 years ago; had it done so, it might have influenced early Sumerian literature, and prevented the denigration of the Anannage by the Babylonians. The Second Diaspora of the Shining Ones dispersed this learning to many parts of the known world - to Western Europe, including Scandinavia, Britain, Ireland and France; to Southern Europe, including Italy, Greece, Crete and Cyprus; and to Egypt, Persia, India and, possibly, China (see The Megalithic Odyssey). But only in Egypt, Persia, India and China is there evidence of spiritual development, and awareness of eschatological problems, before the second millennium BC. There could be two possible reasons for this restriction of spiritual development: (a) only the populations of the latter regions were sufficiently advanced, in the third millennium BC, for spiritual teaching to have been of any value; or (b) these regions came under Anannage control at an earlier stage - namely after the First Diaspora in about 5500 BC. The case for preferring (b) - although (a) may also have some claim to truth - is to be found in the history of Egypt where a figure with all the characteristics of an Anannage Lord appeared on the scene in the pre-dynastic period, possibly as early as the sixth millennium BC. This figure was Osiris, whose influence in Egypt was similar to that of Enlil in Eden. His appearance, there, suggests that after the destruction of Kharsag not all the Anannage Lords settled in the Mesopotamian Valley; Osiris moved to Egypt with at least three companions - Thoth, Anubis and Upuant - and, since there were fifty Anannage Lords, it is reasonable to suppose that others traveled even further afield. Just as Kharsag can be seen to have been the first centre for agricultural teaching, so Egypt appears to have been the source of early spiritual teaching - though agriculture had to be taught there first. As the physical needs of Man were catered for by Enlil and Ninlil all over Eden, so his spiritual needs were fostered by Osiris and Isis, and kept alive by the continuity of the teaching fraternity at On for some four millennia, eventually to meet its own diaspora when confronted with the pragmatic standards of Rome. The tragedy of the debasement of Knowledge in Egypt stemmed from the polytheism of the invading culture. When religions and particularly those based on false premises concerning those they pronounce as 'gods', overtake simple spiritual truths, the latter tend to be swamped in a morass of ritual and dogma. Elsewhere, judging from the teaching, which appears to have sprung from an Anannage source - as in India - the early spiritual discussions were of an eschatological and cosmological nature, which placed Man in his true relationship with the Universe and with those little understood forces that lie behind it. Man's experiences in this field are of a mystical nature, and the teaching at On fully reflected this; the tragedy of debasement lies in the injection of restricting dogma and mindless ritual into a process which should be as free as the air. The point has been well stated by Stace. Most writers on mysticism seem to take it for granted that mystical experience is a religious experience, and that mysticism is necessarily a religious phenomenon. They seem to think that mysticism and religious mysticism are one and the same thing. But this is not correct. There are several grounds for insisting that intrinsically, and in itself, mystical experience is not a religious phenomenon at all and that its connection with religion is subsequent, and even adventitious. In the first place, it seems to be clear that if we strip the mystical experience of all intellectual interpretation such as that which identifies it with God, or with the absolute, or with the soul of the world, what is left is simply the undifferentiated unity. From what is left to us of early spiritual teaching, where it is still untouched by religious glosses, it is clear that the source from which the teaching sprang was rooted in this concept of the undifferentiated unity of all things. In our opinion, it is from the experience of this unity that religious dogmas have grown, in an attempt to pass on the knowledge of it, and to prepare the ground for it. It seems to us that the multiplicity of religious statements of Mankind all say the same thing in different ways; indeed, sometimes they say the same things in the same ways, even though these statements are widely separated in time and space. That Man has been more concerned to foster the differences in these statements than in accentuating their basic similarities, is the second tragedy in the debasement of Knowledge. The reason for this tragedy appears to be, that in the absence of his teachers, Man quickly lost touch with the unified reality; and, focusing his attention on personalities, placed the memory of them before the memory of their teaching. In Sumer for example, which should have developed into the University of Mankind, the arrival of Semitic influence forcing the Second Diaspora, led through the cult of the individual, to the worship of the individual. And worship led, in turn, to ritual and votive practices in which the pure flame of the spiritual teaching flickered and died, swamped by the deifying adulation of those who mistook the image for the substance. Out of this adulation, which was not confined to Sumer and Babylon, and out of attempts to pass on experiences, which were not understood, grew the religious precepts, which were to cloak the Truth in a miasma of speculation, and to suppress those first, simple statements on Man's place in the Universe, which he needs, desperately, to rediscover. We have found glimpses of this universal Truth behind all the major religions; and, in this chapter, the intent is not only to expose these insights and demonstrate their fundamental unity and sameness, but also to determine where, in historical times, the emergence of spiritual teachers has attempted to turn Man back in the direction of the simple Truths. We shall continue as we began, by discussing what we know of Osiris, probably the earliest of the spiritual teachers to demonstrate to Man that he had an immortal soul. Osiris, handsome of countenance, dark-skinned and taller than all other men, is a mythological figure from the mists of ancient Egypt's earliest history. According to Gwyn Griffiths, the first mention of Osiris occurs in the Pyramid texts, the earliest religious writings in Egyptian literature, dated between 2500 and 2270 BC. The funerary texts of King Neuserre of the Fifth Dynasty were the first to bear his name, and a representation of him is said to appear in an unpublished fragment from the mortuary temple of a later Fifth Dynasty king, Djedkare. In this early literature, Osiris is depicted as a 'funerary god' giving those who trusted in him the hope of an eternally happy life in another world, ruled over by a just and good King. Although the earliest evidence for the funerary cult is in the Pyramid texts of Wenis, dating from the closing phases of the Fifth Dynast}', the material is generally recognised to have been passed down from a much earlier period; a period which Griffiths suggests was in, or even before, the First Dynasty - with connections with the royal funerals at Abydos. And if the Egyptian Book of the Dead, which already showed the signs of debasement, which was the tragedy of Babylon, is to be given the antiquity that many scholars place on it, Osiris's original teaching of the immortality of the spirit must have been undertaken at a time closer to the occupation of Kharsag than to that of the first Pharaohs. In the mythological record, the principal Lords of Egypt reigned for a time and then retired to heaven. From this statement, we may assume that their permanent headquarters were in the Highlands of Eden, and that they were seconded to Egypt, probably for a fixed term, before being relieved by successors in their posts. It is recorded that Geb succeeded Ra on the latter's retirement, and Osiris succeeded on Geb's retirement. The early dating of Osiris' tenure of office is also suggested by his first care which was stated to have been the abolition of cannibalism and the teaching of the first steps in agriculture to his still half-savage subjects. He taught the fashioning of agricultural instruments, the production of grain for bread, the growing of grapes, and the making of wine and beer. The close similarity between this description of his activities, and those of Enlil at Kharsag, make it clear that the Anannage had more than one 'civilising team' in operation. Osiris is said to have laid down rules governing 'religious practice' (although we cannot assess, over this long time-span, what meaning should be given to 'religious'), and to have constructed two kinds of flute to accompany ceremonial songs. We strongly suspect that this activity introduced music and singing, and probably dancing, into occasions of social celebration. But, because of the later ~deification of Osiris, these joyful occasions passed into ceremonial as an essential accompaniment to the worship of the 'deity' - and an essential accompaniment it has remained to the present day. Later, he built towns, and gave his people just laws, as a result of which he became known as Omnophris - 'the Good One'; an epithet reminiscent of the Daghda Mor, in Ireland - 'the Good God'. The original spiritual teaching of Osiris has no record as such, and we can only make assumptions about it based on what is known of later practices after the teaching had become debased. In quite early times there were ritual practices for the elite, using an advanced psychology. There were temples set aside, within the larger Temple complexes, for the Secret Mysteries which were quite apart from the mainstream of common worship. These secret mysteries were known as the Rites of Osiris, and it would seem reasonable to assume that they would have stemmed directly from the original teaching, even if confusions and deviations occurred with time. In particular, the purest and most concentrated strains of the teaching concepts might be expected to be found in the ceremonies of Initiation, which were the groundwork for the spiritual development of the novitiate. On this subject, we quote from Brunton. The experience of initiation was a miniature duplicate of the experience which was destined to become that of the whole human rare through the processes of evolution - the sole difference being that, as the former was a forced hurried growth, an artificial process like entrancement was employed, whereas with the latter both psychic and spiritual development would proceed naturally. The principle, which lay at the back of it was that man's normal worldly nature could be temporarily paralysed by a profound lethargic sleep, and his usually unnoticed psychic. or spiritual, nature wakened by processes known only to the hierophant ... Only in such a state was it possible for man to perceive the spirit-world as it was perceived by the spirits, themselves, to see visions of the gods and angels, to be taken through infinite spare, to know his innermost self, and, ultimately, to know the true God. Only the supreme hierophants, themselves, at one with their divinities, their wills blent with his, could by their astonishing divine force arouse the candidate to consciousness of his superior nature. This was the noblest and most impressive revelation then possible to Egyptian man, and still possible, albeit through other ways, to modern man. Osiris was intimately connected with that mind-opening experience, which is known to have been undergone by such famous initiates of the ancient world as Pythagoras, Sophocles, Aeschylus, Solon, Cicero, Pindar, Heraclitus and Plotinus among others. The highest doctrine of the Egyptians, that which was the theoretical basis of the loftiest degree of initiation, was that the soul of man must eventually return to the Divine Being from which it was first rayed out, and they termed this return 'becoming Osiris'. They held man, even here on earth, to be potentially an Osiris. In their secret manual of initiation, The Book of the Dead, the released soul of the candidate is directed to protect itself in its long and dangerous journey through the underworld not only by the use of amulets, but by boldly proclaiming 'I am Osiris'. The primary distinction between the Anannage and Man, despite their genetic compatibility, appears to be the possession by the Anannage race of a full measure of the quality, or essence, which the Akkadians termed e-te-em-mu, and which the authors have translated as 'spirit'. The problem with such esoteric terms is that, even if we knew what we meant by 'spirit' (which we do not), there is no way of knowing what the Akkadians meant by e-te-em-mu. The nearest that we can get to it, is to describe it as 'an indefinable essence that lives on after the death of the body: Therefore, by hybridising their stock with the human strain, the Anannage had conferred a degree of immortality to Patriarchal Man. And this concept is compatible with the beliefs of the early Egyptians. But in raising this point, we make further difficulties for ourselves. The early Egyptians were not of the Patriarchal stock produced in the laboratories of the Building of Knowledge in Eden - they were descendants of the original Cro-Magnon race. If, then, the Egyptians, too, had within them the seeds of immortality, this strengthens the case for considering Cro-Magnon Man as a hybrid of Anannage and Neanderthal strains; Osiris would not have encouraged his Egyptian subjects to believe in an afterlife unless he knew that they possessed the essence of etemmu. The quintessence of the Egyptian mystical teaching, and indeed of most later spiritual instruction, appears to have been the emphasis on this Anannage quality, which we all possess in some degree; and which, if we can bring it into our consciousness and develop its full potential, is capable of raising us to the level of our 'divine' progenitors. But the rapidly accelerated release of this potential in one undergoing Initiation was held to be a very dangerous procedure, as Brunton continued to explain. The hierophants who had undertaken to initiate a candidate likewise undertook a heavy responsibility. His life was in their hands. For an unexpected intruder to interrupt the sacred rite of initiation meant his death, no less than an unexpected intrusion upon a delicate surgical operation in our time might mean the death of the unfortunate patient. And what, after all, was initiation but a kind of psychical operation, a separation of the psychic from the physical part of man? Things here are signs; they show, therefore, to the wisest teachers how the Supreme God is known; the instructed priest reading the sign may enter the holy place and make real the vision of the inaccessible. It is interesting to note that Plotinus's profound remark comes from the Enneads under the heading, 'On the Good, or the One', a description that was applied to Osiris. This taboo on the divulgence of the 'secrets' to any who were not initiated takes us back to those secrets which were divulged by the apostate Watchers to their wives and children, and which caused such consternation in the Angelic settlement. It is possible that, after that fiasco, a much closer control was kept by the Anannage, on those to whom the mysteries were communicated. Whether Osiris's love of music was a characteristic of the Shining Ones or whether it was a personal idiosyncrasy, we cannot tell; certainly, music is not mentioned in the Kharsag epics, or in the records of Enoch, but these concern a very early period in Mans chronicles of the Anannage. However, the traditional association of Angels with harps, trumpets and other musical instruments, and the well-documented harp-playing by the Tuatha De Danann at Tara, both suggest an innate love of music; and yet Osiris may have been a virtuoso in his own right. And lead them safe in Wisdom's way. The equal standing of the enlightened woman with the enlightened man is worth noting as a concept, which faded with the passing of the ancient order. The next quotation from Paul Brunton is of value for the light that it may throw on the practice of the very ancient World of referring to the senior Shining Ones as 'Serpents'. It suggests that the Serpent, or Snake, was symbol among the ancient Egyptian hierarchy for the energising, creative force of the Supreme Spirit. The serpent is self-moving; it is unassisted by hands, feet or external limbs. So, too, is the Creative Force entirely self-moving as it passes from form to form in its building of a whole world or a single creature... It stood, in these innermost rites, for the working of the Force which freed the soul of man during initiation, a force which slowly crept through the body of the entranced initiate almost exactly like the slow creeping of a snake. This passage may be compared with the Indian concept of the Kundalini, which is defined by B. K. S. Iyengar as the divine cosmic energy, symbolized as a coiled and sleeping female serpent lying dormant in the last nerve centre at the base of the spinal column - the Susumna. When this rises to pierce the chakras right up to the Sahasrara - the thousand-petalled lotus in the head - then, he says, the Yogi is in union with the Supreme Universal Soul. In this mystical connection between a basic, energizing cosmic force and the symbolic form and movement of the serpent, may lie the real explanation for the use of the term 'Serpents' for the senior Shining Ones in the Garden in Eden, and the term 'Serpent Lady' for Ninkharsag. In this context, the appellation would have a spiritual connotation rather than an intellectual one. The Senior Anannage would have been the 'Initiated Ones', members of a higher spiritual order than that which embraced their juniors. In ancient times, the 'healing force' was considered to be just such an energizing force, and it would have been entirely in character with this concept for the powers and skills of Raphael, and his medical group, to have been associated with the Kundalini - the coiled serpent. This would have been personified in Beletili because of her biological ability to direct the force into the creation of life. Thus, it may have been the spiritual attainments of the 'Serpents' that provided the energy which powered the shining countenances of the Anannage, and their fiery eyes. If this is so, we have discovered another dimension for the Shining Ones; a dimension which would have allowed them to organize the spiritual development of the human race as well as its physical needs. We have chosen to discuss the broad aspects of the initiation rites of the Mysteries of Osiris, at some length, because these activities recur again and again, as a unifying thread throughout later world religions. The desire for union with the 'One Good God'; the willingness to work towards that goal; the spiritual exercises; the instructions of the priests; and the final achievement of joy and liberation; form a pattern, which is repeated, almost universally. Life after death - if the heart has proved true - is also an embedded tradition, which stems from Osirian and, therefore, Anannage teaching. In ancient Egypt, Truth was symbolized by a goddess - Maat - who was depicted sitting on her heels. She was the goddess of Justice, too, and images of her stood in the halls of Justice, the Law Courts, as a constant reminder of the power of Truth. Upon death, the heart of the dead person was visualized as being weighed in a balance against the figure of Maat (often represented by a vertical feather) in the opposing pan. It was said that the gods loved Truth above all other things, and they could not be offered anything, which they enjoyed more. We believe this to be a commentary on the nature of Osiris, and on the character of the Shining Ones. It suggests a constant pre-occupation with the pursuit of Knowledge - a seeking after the Truth; their unalienable concern with which must have been perplexing to the simple minds of early men. The name of Osiris, itself, makes a fascinating study; though scholars differ widely as to its meaning. The expression is the Greek interpretation of an Egyptian word, the earliest form of which was written with the hieroglyph for a 'throne', followed by the sign for an 'eye'. Phonetically, it was transliterated as wsr. Later on, there were many variations both in the signs themselves and in their order, and this could have been due to the practice of paronomasia (punning) which, like the Sumerians, the Egyptians delighted in using. Because the Egyptians had a delight in paronomasia, and particularly in their religious literature, they would have been able to assemble a variety of meanings within one composite name sign. We suggest, therefore, that modem scholars are probably nearly all correct in their varying interpretations. Osiris may have meant - 'doing much' (Lablonski); 'the Judge' (Sharpe); 'the son of the earth' (Louth); 'the residence of the sun' (Lefebure); 'he who occupies the throne' (Erman); 'the might of the eyeball' (Brugsch); 'he who takes his seat, or throne: (Budge); 'he who created justice' (Westendorf); and 'the Mighty One' (Gwyn Griffiths). All these could have been valid epithets for Osiris, 'king' and 'god' to the early historic and prehistoric Egyptians. They reveal an important Being, held in awe, who had a powerful connection with the Sun; who created just laws and made judgments; and who, in his earliest contacts with the people of the Nile Valley, brought to them those skills in agriculture and food production, which were to transform their lives. As such, he is a familiar figure in this study - a Lord of the Anannage, a Shining One. In the second Kharsag epic, we recorded the arrival at Kharsag of 'the Anunna, the Many Wise Ones'. The three consonants forming the root of the phonetic interpretation of Osiris's name - WSR - we believe to be the root, also, of an early Indo-European word which has come down to us in the English term 'wizard', and the Arabic 'vizier; both of these have connotations of 'wisdom" which, basically, also has the same root. Osiris was one of the Wise Ones'! '. Zoroaster, or Zarathushtra, as he was known in his native Persia, was the most magnetic personality of any spiritual leader to emerge in the Middle East in ancient times. Because of the destruction of much of the sacred writings in Persia, at the time of the Moslem invasion in the seventh century AD, only sporadic accounts of Zoroaster and his life are still available to us. Rustomjee, his Parsee biographer, claimed that he lived 'ages before Prophets like Abraham, Moses, Buddha, Confucius, Jesus and Mohammed'. This quoted span of two and a half millennia is unhelpful in placing Zoroaster in a chronological context. Of more value is the undoubted influence, which he had on the thinking of post-exilic Jews, and on the spiritual life of the Mediterranean area immediately prior to the birth of Christ. As a result of this, many scholars place his birth around the beginning of the sixth century BC; but the possibility of a much earlier dating should be borne in mind. There are traditions of a miraculous birth, but these are impossible to substantiate. He is also said to have smiled at birth in a manner reminiscent of the baby Noah. At the age of fifteen, Zoroaster started to meditate alone on a mountain, and began his mission to humanity fifteen years later, at the age of thirty. He was unhappy about the moral state of his country and wanted to find a solution to the unhappiness of men; this led him to leave his father's house, and to set out across country with a band of followers. Reaching the River Abahi, he walked across it on the surface of the water, and helped his followers to do the same. On the far bank, it is claimed that Zoroaster was 'transfigured'; in the words of Rustomjee, 'his body became purified and began to glitter, just as gold becomes purified when melted over the fire'. His mission in life, as he saw it, was first to perfect himself, and then to teach all humanity to achieve the same. To this end, he advocated a pure diet to keep the body strong and vital, and so develop the powers of the mind in man on the 'Path of Righteous- ness'. He is stated to have been the greatest healer of diseases, and of disorders of the human system, of his time - solely through his spiritual powers. .. and this is what I saw,: a man dressed in linen with a girdle of pure gold round his waist.. There are many instances, in the literature, of the Anannage Lords being dressed in white linen with girdles around the waist. The teachings of Zoroaster were based on belief in the One Good God - Ahura Mazda - whose name combined the elements of wisdom and light, and whose symbol, the Winged Disc, has been shown by us to have parallels with the Egyptian symbol, the Eye of Horus; parallels sufficiently compelling to argue a common origin. And these two symbols have so much in common with the aerial craft of Yahweh, that the possibility has to be considered that Ahura Mazda was the Persian name for the Supreme Commander of the Shining Ones - the lord Anu, the Most High. Admittedly, Ahura Mazda is worshipped by the Zoroastrians as the Supreme God who is an ethereal Heavenly figure, above all earthly matters, but this view was also taken of Anu by the Babylonians; and of the Most High by the Jewish people. They both thought of their Deity as being resident in high 'Heaven', not appreciating that this was an alternative name for the Highlands of Eden. If we assume this equation of Ahura Mazda with Anu, it becomes possible to suggest that he and Zoroaster may have been contemporaries, and may even have met. If this were the case, we could state that, although Zoroaster's spiritual teaching, stemming from the Anannage, would have been without flaw, the later religious interpretations of the Zoroastrians must be considered suspect. Zoroaster spoke of a future life, a last judgment, the immortality of the soul, and of a divine-human Saviour to come. That Isaiah also prophesied concerning a divine human Saviour should not surprise us; the two men may have served two fraternal Masters who, doubtless, were aware of the long-term plans for the spiritual development of Mankind. He taught that when the Golden Millennium finally arrived, and God's creation was merged with God, a man's soul would retain its own personality while God retained His own unique personality, transcending all others. At that time, man's mind would have been so reformed and purified that God's plan would have been accomplished, and the purpose of His creation would have fully realised His highest expectations. The reader will already have detected many similarities between Zoroaster and Jesus of Nazareth whom he pre-dated by at least six hundred years. These similarities include a possible 'miraculous' birth; a teaching life that began at the age of thirty; a band of followers; the ability to walk on water; transfiguration; an ascetic life; great powers of healing; and a spiritual dependence on a 'Father in Heaven'. Furthermore, there are distinct similarities in the teachings of the two 'Prophets'. Zoroaster's was based on the concept of being - the ability of the individual will to choose good ways or bad ways; the simple slogan was 'Good Words - Good Thoughts - Good Deeds', exhortations which are at the root of Christian teaching, too. Therefore, build not thy faith upon what is transitory and impermanent. It is not the purpose of God, that I should forgive sins, and relieve thee from the just reactions of the deeds thou hast done in this life. Therefore, upon thee and thee alone rests thine future happiness. Thou shalt reap but the fruits of that which thou hast sown. If thou hast sown good seeds these shall bear forth good fruits. [MAT 6:19-21 JB VB] Do not store up treasures for yourself on earth, where moths and woodworm destroy them and thieves can break in and steal. [MAT 7:16-18 JB VB] .You will be able to tell them by their fruits. Can people pick grapes from thorns, or figs from thistles? In the same way, a sound tree produces good fruit but a rotten tree bad fruit. That these parallels may exist because of the presence of a common strain of ancient teaching is suggested by a similar quotation from the Indian Upanishads, many of which predate Zoroaster. [KATHA UPANISHAD: VB] I know that treasures may pass away and that the eternal is not reached by the transient. I have thus laid the fire of sacrifice of Nachikita, and by burning in it the transient, I have reached the Eternal. The contents of the original Avesta are stated to have consisted of all the Lore of the World, and the Revelations concerning the mysteries of Nature; and also God's admonitions in relation to life's journey in this and other worlds. That the Avesta may have been taken from a version of the Anannage books, is a distinct possibility. (i) Zoroaster's laws for the cultivation of the soil, his rule of agriculture and pasture, his directions to Mankind to protect the innocent animals of the world, were intended to make this earth a truly joyful spot in God's Universe. (ii) Should modem science deem it worthy and be able to understand the real meaning of the spirit of the Avesta, it would soon find out that Zoroaster knew all the laws and operations of nature far better than all the philosophers, scientists and astronomers of today. Galileo, Newton and Kepler would have to learn from their master astronomer. Darwin would be put to shame if he understood the theory of evolution as taught by Zoroaster. Practically all the precepts of purity, all moral and religious exercises, all sacrifices and healings were based on the deepest and profoundest studies of Nature's laws in all domains, physical, spiritual and intellectual. (i) from Rustomjee; (ii) from David Amman's Appreciation of Gems from The Divine Songs of Zoroaster. Brave words indeed - but impossible to substantiate. And yet there is much that is familiar in this statement of the existence of an ancient wisdom, committed to writing in the dimly perceived ages of prehistory, and subsequently lost to the world. When therefore the proper time had come for initiating them into the mysteries of the Soul, Holy Zarathushtra made formal offerings to Ahura Mazda of sanctified bread, milk, flowers, pomegranate and the juice of the Haoma plant. Gushtasp was then directed to partake of the 'juice of the haoma plant'. When this was done, Gushtap fell into a trance in which condition he remained for three days. In this condition, Gushtasp had an inner vision of the peregrinations of his Soul to the Spiritual Realms. The splendours of the spirit-world created a profound impression upon Gushtasp. Zarathushtra felt sanguine about the ability of these three chosen men of Gushtasp, and was willing to impart to them that hidden knowledge about the mysteries of Nature and Science. Behold within you the Haoma-Tree that grows in the sea of Vourukash that is also within you. In interpreting the symbolic meaning of the Haoma-ree, Rustomjee considered that Zoroaster was alluding to the human framework as being comparable to a Haoma-Tree. The human backbone reveals the stem of that tree and its branches are spread out in the body. The tree the cerebro-spinal system - contains a fluid that has its link with the machinery of the human mind. Gushtasp was given the juice of the crushed plant as a symbol of that rich fluid within his own system that laved the human brain, and which was responsible for all actions of the human soul. Gushtasp's one purpose in life, from then on, lay in keeping pure and unsullied that Haoma-Tree in his system, the juice of which was the be-all and end-all, of his happiness and sorrows. Medical science, wrote Rustomjee, is very gradually beginning to see the vital necessity of conserving the purity of that fluid which is medically known as the cerebro-spinal fluid. The entire ritual of Zoroaster's religion, on the subject of the crushing of the Haoma plant, was to impress upon Mankind the potency of the cerebro- spinal fluid in the human framework. Whether this symbolism was really part of Zoroaster's teaching, we find it hard to decide; certainly, its similarity to the principle of Kundalini is striking, and also to the concepts of Osiris, but the possibility that Rustomjee, himself, or earlier writers, have superimposed Hindu thinking upon original Parsee concepts has to be borne in mind. Siddhartha Gotama was born in 563 BC into a noble family in Kapilavastu, a city of north-eastern India, the exact position of which is not known today, but which may have been within the area covered by the modern state of Nepal. Gotama became the Buddha - the enlightened one - after a spiritual struggle lasting six or seven years. The first part of his name, Siddha, is a word meaning 'sage': 'seer: or 'prophet'; and also, according to a definition by Iyengar, a 'semi-divine being of great purity and holiness'. But whether this was a name given at birth, or one that became attached to him in later life, after enlightenment, is not known. There was an angelic annunciation [by Devas] to his father. His mother was a virgin for thirty-two months [sic]. Devas [angels) sang at his birth. Asita ... predicted his future greatness. He fasted forty-nine days, and was tempted by Mara, the spirit of evil, to turn the Himalayas into gold. He performed thirty-two healing miracles, was transfigured, had an original band, or Sangha, of twelve followers, fed 500 persons from one small cake, had a disciple who walked on water and sank [cf. the apostle, Peter], and when taken to a temple for a ceremony, conformed, but said that it was not necessary. Of course, Bouquet has selected these legendary episodes to illustrate their similarity to those in which Jesus of Nazereth was involved. Care has to be taken in weighting such selections, but the ten chosen episodes are so remarkable in their compatibility with events in the New Testament that they must have some significance in uniting the lives of two spiritual leaders separated by nearly six hundred years of time. What that significance could be, will be considered later. In contrast to the humble setting of Jesus (according to the Gospels), Gotama was brought up in luxury as a prince who would succeed his father in ruling a minor kingdom. This luxurious life only satisfied him during his youth, and at the age of twenty-nine (his thirtieth year) he set out from the palace, leaving his wife and small son, to find the meaning of human existence. He traveled widely and underwent many privations but, over six years, he failed to find what he sought. Finally, in a mood of desperation, he sat down under a peepul tree (the sacred fig) and meditated, in what can only be described as a 'do-or-die' attitude. Possibly, through the intensity of his concentration, or the depth of his desperation, enlightenment came to him under the tree near the small town of Uruvela, south of Patna. Out of this enlightenment, broadened by subsequent experience and his tolerant Hindu heritage, he developed a system of teaching for the people of India, which was more advice than commandment. Right meditation - on all the mysteries of life. These rules are very much at one with the good thoughts, good words and good deeds of the Zoroastrians; but, as practical rules for the ordinary man, they perhaps go a step further and attempt to bring mysticism - which Zoroaster would have reserved for covert teaching - into daily life. According to Bouquet, Gotama sought to be practical, and to make others practical - to uplift while keeping the feet on the ground. In this very sensible precept, he echoes the Sufis, and anticipates the advice of Jesus to be 'in the World, but not of the World'. Bouquet considered it clear that, in the main, Gotama accepted the Upanishadic background of the Unknowable Absolute - and the Great Self, profound and fathomless. His basic aim was to live - and to teach how to live - a chaste, temperate and kindly life of moderation by the aid of this Inner Light. In these concepts, we are reminded of Jesus's Kingdom of God - which is within - the attainment of which should be the first principle of life. The message of the Upanishads, which grew out of the more ancient Vedas, the Books of Knowledge, was that in everything there is a Spirit, all knowing but unknowable, ineffable; and that the contact with this Spirit is the only goal worth working for in the life of a man. This Spirit, the fundamental of all existence, is stated to be 'Brahma'. The experience of the reality of the Supreme Spirit takes place in a different state of consciousness - not waking, not sleeping, not dreaming; and all man's energies should be directed towards attaining that fourth state. The experience is indescribable. Although indescribable, the experience is common to all three of the teachings, which we have considered so far. In all three, it is the ultimate goal desirable for mankind; only the method of achievement varies. To the Osirian, it was achieved by rites of initiation assisted by a hierophant skilled in teaching, and helping, its attainment; the Zoroastrian hierophant achieved it with the help of the juice of the Haoma plant - which may have been available to the Egyptian as well. The followers of the Buddha, on the other hand, attained it solely by self-discipline and application. In the Upanishads, a way of living is revealed, by which the individual is enabled to exist in tune with the Infinite. That way is meditation upon the Supreme Spirit; and, by the practice of self-discipline, encouragement of oneself to triumph over the vanities of the little spirit in man. Gotama regularised such practices of self-discipline to prevent them from getting out of hand. Self-discipline was not to become too austere; meditation was not to be forced on a body weakened by too much fasting. He understood man's task in life to be a progression towards a richer, inner life, guided by the Supreme Spirit within each person; very much as Abraham Maslow, much more recently; visualized the development of people into self-actualizing, fully-rounded personalities. Although Gotama did not dwell on the subject, the Hindu of his time believed in reincarnation; and Bouquet commented that primitive Buddhism, as distinct from institutionalised Buddhism, even has traces 'of a post-mortem tribunal with an adjudicator, or controller, who was called Dhamma-Raja, the Lord of the Way'. If this is so, there appears to be common ground with the Egyptian concept of weighing the heart of the dead against Truth, in front of the Judge of the Dead. Gotama was a practitioner of Yoga, as it can be no coincidence that he was so frequently portrayed meditating in the lotus position. Yoga is very much older than the time of Gotama; its beginnings are so ancient as to be un-dateable. A Sumerian figure of a woman in an attitude of meditation can be dated to the end of the fourth, or the beginning of the third millennium BC; while a seal from Mohenjo-daro in the Indus Valley, shows a male figure sitting in a cross-legged position with hands outstretched, also in an attitude of meditation - it is dated to between 2500 and 1700 BC. 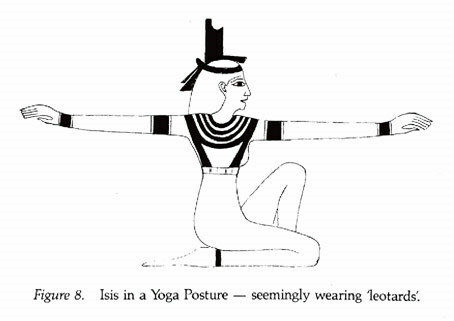 Isis, the consort of Osiris, is pictured in a Yoga pose, ostensibly wearing leotards, in a wall painting in the tomb of Seti I (Figure 8); and there is a modeled likeness of a young Pharaoh on a plinth, possibly Ramases II, in an obvious pose; and a statue of the so-called 'suppliant, Nekhtarch' similarly holding a Yoga posture. Yoga was, and is, the practice of self-harmony with a view to spiritual development and transcendence of the spirit over the body, leading to the yoking of that spirit with the Supreme Spirit. As such, and in view of its great antiquity, Yoga may be the common, practical thread, which has linked all the earliest and purest forms of the great religions. Using bodily postures to achieve that control over the body and mind that Gotama advocated - and not least in disciplining the will - Yoga may also be a pointer to that single source of spiritual teaching, which is beginning to appear in our study. The exercise movements, which are part of Yoga practice, are called asanas, and some records suggest that they were evolved by wise men of the past who, concerned at the brief expectation of life, set out to create a means of raising the standard of health, and of increasing the life-span. These exercises form the third state of Yoga - Hatha Yoga; the first two being Yama (ethical disciplines) and Niyama (rules of conduct for individual discipline). There are physiological reasons for the postures, according to the results that they bring about. The lotus position, for example, is favoured by yogis as a meditation pose because of the way that the folded legs cut off the circulation and release more blood to the brain. The back is kept straight to allow the flow of energy upwards through the spinal column without hindrance. At some time, a straight back and moral rectitude became intimately associated. There is, too, in the practice of Yoga, such a thing as a sequence of asanas - a group of exercises worked out to have a cumulative effect. 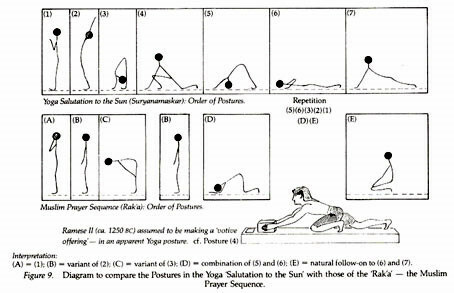 One of the sequences is known as Suryanamaskar - 'Salutation to the Sun: and is described by Andre van Lysebeth. It is made up of twelve successive movements, repeated one after the other, which serve to bring the whole muscular structure into play, warming it up and conditioning it for the asanas. Suryanamaskar has been extolled by the Rajah of Aundh as producing 'health and strength, and the efficiency and longevity, which is the right of every human being'. It is intended to be a daily routine, a maintenance exercise for awareness and development. More significantly, it requires only two square meters of space, and has a remarkable resemblance to the Moslem prayer sequence; and it may be that the kneeling posture of the praying Christian has a common origin. Somewhere in the distant past, Man discovered a series of physical exercises, which not only improved his bodily condition, and prevented an early death, but also stimulated his spiritual experience and brought him closer to the Supreme Spirit - exercises which only required a very small area of space. They became 'religious exercises'; and we believe that this implies that they became associated with the racial memory of man's 'divine' benefactors. Of course, it would be pure speculation to suggest that early Man had copied what he had seen the Anannage doing; and yet such exercises would have been essential to health in any protracted travel in a restricted space. Source of all creation, we have light, spiritual vision. Inner yoga is said to be above the Scriptures, because the Scriptures may be contradictory: above all past and future Scriptures the Gita places spiritual experience. [DH:153-154 VB] I have gone around in vain the cycles of many lives - ever striving to find the builder of the house of life and death. How great is the sorrow of life that must die! But now I have seen thee, house-builder: never more shalt thou build this house. The rafters of sin are broken, the ridge-pole of ignorance is destroyed. The fever of craving is past; for my mortal mind is gone to the joy of the immortal NIRVANA. [Words of Meng-Tzu] Every man possesses in himself the four principles of benevolence, justice, propriety and wisdom, and that man has only to obey the law within himself in order to be perfect. However, this teaching did not succeed at the time, and Confucius died in 479 BC considering that he had failed in his mission. Not until about 209 BC did his ideas receive recognition, and then he, himself, was given adulation as a supernatural being at the same time - a pattern frequently found among Masters of the ancient world. In his life's work, Confucius came after another great Chinese scholar and teacher, Lao-Tse, who is believed to have lived a little earlier. Both Lao-Tse's and Confucius's teachings were grounded in the tao, the ancient Chinese way of thought founded by the Emperor Huang Ti who lived from 2698 to 2597 BC. This emperor is credited with setting up a calendrical system of sexagesimal cycles at the beginning of his reign. But it may be significant that this period roughly coincided with the Second Diaspora of the Anannage out of the Land of Sumer, where such a numerical system was already in existence. It is not impossible, therefore, that one of the Shining Ones introduced the Emperor Huang Ti to the enlightened way of tao, some two thousand years before it was taught by Lao-Tse and Confucius. In his attitude to life, Lao-Tse took a less purposeful stand than Confucius, feeling that it should be lived in complete acceptance of, and non-interference with, the natural order - in joyful admiration. This cosmogony is explained in a manifesto dating back to the time of imperial antiquity. [Khigh Alx Dhiegh in Taoist Book of Days:] A brief explanation begins the concept that every misfortune is caused by a disturbance to the harmonious inter-action of the Five Elements in the specific situation. Hence, one must exercise caution so as not to interfere with the processes of nature or disrupt the state of natural conditions too much. After their disastrous attempt to control Nature - which led directly to the destruction of the Settlement of Kharsag - it would not be unduly surprising to find the Shining Ones espousing a philosophy of this kind. The tao of Lao-Tse is defined by Richard Wilhelm as 'the course of things, the principle of the one in the many'. Arising from this, came the idea of the origin of things - t'ai chi - and the complementary elements, the firm and the yielding, later to be known as yang and yin; and all the actions and interactions of everything natural. The Universe was conceived as an integrated, inter-related and inter-dependent whole - a philosophy which is only now coming to fruition with the attempts of modem astronomers and physicists to establish a unified theory for the weak and strong forces of Nature. The best description of tao, which we know, comes from the I Ching in the section Ta Chuan, the 'Great Treatise'. As the power that completes things, the power that lends them their individuality and gives them a centre around which they organise, the tao is called the essence, that with which things are endowed at their origin. Tao reveals itself differently to each individual, according to his own nature. The man of deeds, for whom kindness and the love of his fellow man are supreme, discovers the tao of cosmic events and calls it supreme kindness - 'God is love'. The contemplative man, for whom calm wisdom is supreme, discovers the tao of the universe and calls it supreme wisdom. The common people live from day to day, continually borne and nourished by tao, but they know nothing of it; they see only what meets the eye. For the way of the superior man, who sees not only things but the tao of things, is rare. The tao of the universe is indeed kindness and wisdom; but essentially tao is also beyond kindness and wisdom. [MAT 13:13 IB VB] The reason I talk to them in parables is they look without seeing and listen without hearing and understanding. From the character of tao comes the inescapable conception of change. Both Lao-Tse and Confucius were familiar with the I Ching, 'The Book of Changes', and the teaching of both of them was permeated by its wisdom. Wilhelm said the best way to explain the working of the Book is to compare it to an electric circuit, penetrating all situations. When contact with anyone situation is established, through the human mind, that situation is lighted up. Confucius studied The Book of Changes deeply in his old age, and edited and annotated the text, which we read today. It is recorded that, standing by a river, he said: 'Everything flows on and on like this river, without pause, day and night' - thereby echoing the Upanishads which refer to the mind that understands change, looking beyond the transitory and into the eternal. The Book of Changes was an attempt by sages in the past to help to guide men through the changes in their lives without turmoil. In the introduction to his translation of the I Ching, Wilhelm said that, in the teaching of Lao-Tse, and of Confucius, there was a concept that every event in the visible world is the effect of an 'image' - that is, the image of an idea in the unseen world. Accordingly, everything that happens on earth is only a reproduction, as it were, of an event in a world beyond our sense of perception; and as regards its occurrence in time, it is later than the suprasensible event. The Sages were in touch with the unseen world and, therefore, could advise ordinary man who was not. [I Ching] Therefore they called the closing of the gates the Receptive, and the opening of the gates the Creative. The alternation between opening and closing they called change. The going backward and forward without ceasing they called penetration. What manifests itself visibly they called an image; what has bodily form they called a tool. What is established in usage they called a pattern. That which furthers on going out and coming in, that which all men live by, they called divine. The closing and the opening of the gates signifies the alternation of rest and movement. These are likewise two conditions pertaining to yoga practice, that are attainable only through individual training. The moment when he enters this serenity is likened to his approaching death that precedes the resurrection, which is the main object of alchemy. As to how death is followed by resurrection, this concerns the method of producing the bright pearl. In this description of the achievement of the different depths of serenity, we can detect the 'psychic surgical operation' outlined in connection with the Rites of Osiris. And the same warning is given that the extreme depth of consciousness, achieved, is so close to death that the utmost care of the initiate has to be taken, particularly with regard to the avoidance of extraneous disturbance. In principle, the Taoist Alchemy is undoubtedly the same practice as that in the Rites of Osiris, and argues a common knowledge, in Egypt and China, of the psychic principles of consciousness and their relationship to the immortality of the Soul. This knowledge must have been the basis for the prevalent belief in eternal life in so many ancient civilisations. Confucius, himself, had this to say about The Book of Changes. The great importance of Confucius to this study lies in his philosophy of Wisdom; his conception of Knowledge raising man to higher levels of existence. Without himself being one of the Anannage (as far as we know), his interpretation of the tao follows their principles and expresses their way of life. The rare, superior man who 'sees not only things, but the tao of things' is experiencing the Unity of Truth - the interrelationship and interdependence of all things. In ending our consideration of the life of Confucius, two of the Master's sayings should be quoted, as indications of the similarity of some parts of his teaching with that of previous and later teachers. They are both from the Analects. The first is reminiscent of the attitude of Osiris to the civilising of Egypt and other countries, which he visited, in which he relied on his music to conquer the hearts of the people. Even when contact is made with uncivilised peoples, kindly sympathy must not be withheld. The second saying of Confucius is remarkably similar to the teaching of Jesus of Nazareth. rule of life. The Master said: Would not "reciprocity" be such a word? Do unto other's as you would wish them to do unto you. Jesus was of the tribe of Judah, and was born in Palestine either in Bethlehem as the Gospels recount or, as has been suggested by those who believe that the Gospel accounts tend to conform with the prophecies of the Old testament, in his home town of Nazareth. The exact date is uncertain, but is likely to have been within the six years prior to the date chosen to start our modem era. His mother was a young Jewish girl by the name of Mariam, reputedly unmarried at the time of his conception; and the identity of his father is open to discussion. He was brought up by Joseph, Mariam's eventual husband, who, on the authority of the Gospels, was a carpenter and builder. The name Jesus was a Greek interpretation, so it is probable that the boy was called Joshua, or Hosea, but we know of no evidence concerning this. Having been brought up in the Hebraic tradition and religion, at the age of twelve (the age of Barmitzvah) Jesus is reported to have been found, by his parents, in the Temple at Jerusalem taking an active and intelligent part in a public teaching circle, which was a feature of Rabbinic life in those times. Miracle stories surround Jesus - stories concerning the nature of his birth, the mode of his ministry, and the aftermath of his death by crucifixion. These stories have strange points of similarity with those surrounding Osiris, Zoroaster and Gotama, but with one fundamental difference. Whereas those concerning the latter .three are principally to be found in tradition; those concerning Jesus are an intrinsic part of the sacred writings of the New Testament, which has given them a validity and credibility, denied to the others, in Christian countries. According to the Gospels of the New Testament, which were written many decades after the events which they describe, Mariam was a virgin and her pregnancy was seemingly miraculously conceived after a visit from the Archangel Gabriel who told her what was about to happen. This was in much the same vein as Yahweh's announcement to Abraham that his wife, Sarah, was to bear a son in her old age; and to Gabriel's announcement to Zechariah, six months earlier than that to Mariam, in which the birth of John the Baptist was foretold. [LK 1:1-19 JB VB] In the days of King Herod of Judaea there lived a priest called Zechariah, who belonged to the Abijah section of the priesthood, and he had a wife, Elizabeth by name, who was a descendant of Aaron. Both were worthy in the sight of God and scrupulously observed all the commandments and observances of the Lord. But they were childless: Elizabeth was barren and they were both getting on in years. Some time later, Elizabeth conceived as promised, but she kept to herself for the first five months. In the sixth month of her pregnancy, her kinswoman, Mariam, received a similar visitation. [LK 1:26-39 JB VB] In the sixth month, the angel Gabriel was sent by God to a town in Galilee called Nazareth, to a virgin betrothed to a man named Joseph, of the House of David; and the virgins name was Mary [Mariam]. He went in and said to her, 'Rejoice so highly favoured! The Lord is with you: She was deeply disturbed by these words and asked herself what this greeting could mean, but the angel said to her, Mary, do not be afraid: you have won God's favour. Listen! You are to conceive and bear a son, and you must name him Jesus [Joshua]. He will be great and will be called Son of the Most High. The lord God will give him the throne of his ancestor David; he will rule over the House of Jacob for ever and his reign will have no end. Mary said to the angel, 'But how can this come about, since I am a virgin?' The Holy Spirit will come upon you', the angel answered, 'and the power of the Most High will cover you with its shadow. And so the child will be holy and will be called the Son of God. Know this too: your kinswoman Elizabeth has, in her old age, herself conceived a son, she whom people called barren is now in her sixth month, for nothing is impossible to God. 'I am the handmaid of the lord: said Mary, let what you have said be done to me: And the angel left her. Two very remarkable stories! but two out of a long line stretching back two thousand years to the time of Abraham... and, perhaps, six thousand more years to the birth of Adam... and, possibly, even a further thirty thousand years to the sudden appearance of Cro-Magnon Man. Stories from different cultures, but with a common theme. But for the first time since the early eighth millenium, the element of apparent parthenogenesis is reintroduced - the development of a female ovum without the benefit of male fertilisation. The birth of Isaac to Sarah, and of John to Elizabeth, could have been from natural fathers; in our culture, we now achieve the same apparent 'miracle' by the use of fertility drugs! In the case of Mariam, however, as in the case of the seven 'foster- mothers' in the Garden in Eden, there was no natural father. And by this, we mean no father available to impregnate the mother in a natural manner. Consequently, before we look for supernatural intervention we must exhaust the possibilities of natural intervention - and these, in the light of the facilities available in the Garden in Eden, are not difficult to postulate. There are two clues that point, decisively, to Anannage intervention. First, the announcing angel was called Gabriel. In Chapter 6, we argued that Gabriel was the Hebraic name for Ninkharsag; and in Chapter 8 we demonstrated that Ninkharsag was the Sumerian name for the Akkadian Belet-ili, who was responsible for the in vitro births of Adam and Eve and their twelve half-siblings. We need have no concern over the fact that, in Luke, Gabriel is stated to have been masculine because he was unlikely to have been the same Gabriel as was present in the early days of the Patriarchs - but a later holder of the position with the same scientific qualifications. Secondly, Gabriel announced that Jesus was to be called 'Son of the Most High' (the italics, here, and in the quoted passage are ours). The Most High was the Hebraic name for the Sumerian, and Akkadian, Anu; the Supreme Commander of the Anannage, who was present at the rebellion of the lordlings and gave his blessing to the solving of the problem by the creation of the lullu ('men'). .By announcing Jesus as the 'Son of the Most High', Gabriel was admitting him into the fraternity of the Anannage, who were all termed the 'Sons of Anu'. It may be counter-argued that the laboratories of the Shining Ones were destroyed in the Destruction of Kharsag, and there is no evidence of their having set up new ones in Palestine, or anywhere else. This is true, but in a footnote on the expression 'the power of the Most High will cover you with its shadow' which occurs towards the end of the passage on the Annunciation to Mariam, the Jerusalem Bible gives a hint to the solution of the dilemma. [1 s.] In O.T. this expression is used of the bright cloud which is the sign of God's presence, Cf.. Ex 13:22 +; 19:16 +;24:16 +. Cf. Lk9:34p. Jesus became like one of the Shining Ones, and he went into the cloud. He went into the aerial craft. The expression 'the power of the Most High will cover you with its shadow' appears to refer to the support, which Mariam would obtain from the aerial craft of the Most High. In other words, we may assume that the scientific expertise, which was required to enable Mariam to carry an Anannage child, was available on the aerial craft. And if the earlier practice, carried out at Kharsag, was followed then one of her own ova would have been fertilised from Anannage sperm - in the laboratory - and placed in her own womb. We can now begin to understand the undoubted 'divinity' of Jesus - the Son of the Most High, and also the Son of Man. In Chapter 8, we suggested that the Patriarchal line, if kept pure through Noah, would be seventy-five per cent Anannage and twenty-five per cent original Man. Jesus was stated to be of the pure strain of David, descendant of Judah - the eldest son of Jacob - and therefore traced his ancestors back through Abraham to Noah. And this descent must have been through Mariam, because Joseph was not his father. If the male element in Mariam's womb were wholly Anannage, then her child would have been seven parts Anannage and only one part Man. The birth was heralded by the appearance of a very bright 'star', which some modern astronomers have linked with a supernova explosion - the catastrophic destruction of a major star, which occurs from time to time in the Galaxy. Others have argued in favour of a near-conjunction of Jupiter and Saturn. The evidence for both of these explanations, in our view, is somewhat forced; and, in the light of Anannage activities, which we have described, it is possible to suggest non-cosmological interpretations of the light phenomenon which accord more closely with the Gospel story. Supernovae, however bright, do not lead Wise Men on journeys over hundreds of miles of wild country which should only be crossed in daylight; and supernovae do not move in relation to other stars - in order to settle over a town in Palestine. We are far more inclined to see, in this 'stellar-like' phenomenon, the reappearance of the familiar aerial craft - whether we call it the 'pillar of fire: Yahweh's craft, the Eye of Horus or the Winged Disc of Ahura Mazda. The Jews, presumably, had not seen the 'pillar of fire' for many centuries; but since it had been accustomed to hovering over the Tent of Yahweh in the Desert, it would not be out of keeping with its character if it hovered over the Inn in Bethlehem. Shepherds, who were very familiar with the night sky - and could recognise Jupiter when they saw it - watched in amazement, as well they might, and found themselves caught up in a celebratory birthday party of Angels who, it may be assumed, were also occupants of the shining craft. At about the age of thirty Jesus was baptised in the River Jordan by his cousin John, an ascetic and wildly oratorical character, who claimed that his mission was to prepare the ground for Jesus' later teaching. He, too, had had a 'miraculous' birth. At the time of his baptism, Jesus had a spiritual experience, which launched him on his career of teaching and healing, after compelling spiritual disciplines. It may be significant that Ezekiel, who had the frightening experience of being transported from Chaldaea to Jerusalem and back, in the 'aerial chariot of Yahweh', referred to his transportation as being lifted up by the 'Spirit'. And we have had some occasion to comment on this connection between the Greek word pneuma = 'spirit' and the aerial craft in earlier chapters. Jesus performed miracles, himself, turning water into wine, walking on water and rescuing a disciple who tried to follow his example; exorcising 'evil spirits: restoring sight and withered limbs, healing serious diseases like leprosy and palsy; and bringing dead people back to life. Aside from his public teaching, he had an inner circle of twelve disciples, whom he taught privately, he was transfigured on a mountain top where, as we have mentioned, he entered a 'cloud' after speaking with a number of Israeli prophets, who had been presumed long dead; he was crucified by the Romans and declared dead, but, after three days, appeared to his friends and ate a breakfast meal with them on the sea-shore - his body having disappeared from the tomb in which it was placed. Out of this powerful personality, and out of his teaching and healing life; and out of his death and the belief in his subsequent resurrection; grew the doctrines, which were to foster the Christian religion and ethic for two thousand years. [MAT 22:37-40 JB VB] You must love the Lord your God with all your heart, with all your soul and with all your mind. This is the greatest and the first commandment. The second resembles it: You must love your neighbour as yourself. On these two commandments hang the whole law, and the Prophets, also. [MAT 5:20 JB VB] For I tell you, if your virtue goes no deeper than that of the Scribes and Pharisees, you will never get into the kingdom of heaven. To those gathered crowds who came to watch him healing, and to be healed, he spoke in simple teaching stories. He explained what the 'kingdom of heaven' was like in a way that the common people could understand, couching his language in homely similes, which they could recognise. Large parts of his teaching, were closely similar, sometimes in words as well as in spirit, to the ancient Indian teaching in the Upanishads, and it is important to consider whether these passages - which include the Sermon on the Mount - were incorporated into the Gospels at a later date, or whether Jesus had had the benefit of studying Indian wisdom, as well as Egyptian. We prefer the latter explanation, but with the qualification that an older, and more universal wisdom, might have been available which, if well documented, would explain even the similarity of wording. We have only space to quote two examples, having already given one under the section on Gotama, and another under Confucius. cf. [Chandogya Upanishad. Tr. Juan Mascaro VB] There is a spirit that is mind and life, light and truth, and vast spaces. He contains all works and desires and all perfumes and tastes. He enfolds the whole universe, and in silence is loving to all. This is the Spirit that is in my heart, smaller than a grain of rice, or a grain of barley, or a grain of mustard seed, or a grain of canary seed. This is the Spirit that is in my heart, greater than the earth, greater than the sky, greater than heaven itself, greater than all these worlds. Jesus followed the Jewish tradition of eating and drinking with his inner group of disciples at special meals. One of these, the 'Last Supper: has become the heart of the Christian ritual and devotion - the Eucharist or Holy Communion. At this special service, bread and wine, which are sanctified and offered to the congregation by the priest, become either directly or symbolically - according to the belief of the supplicant - the body and blood of Christ, which then infuses the human bodies of the communicants. In this ceremony, the spirit of Jesus enters the ordinary spirits of men and women and redeems them, as the spirit of Osiris redeemed the believing Egyptians entering the unknown world of death. The clearest evidence of Jesus's knowledge and use of magic is in the eucharist, a magical rite of a familiar sort. ... [the story] of the Eucharist is a simple report of a familiar magical operation giving enchanted food to cause love. Often the food is identified with the body and/or blood of a god with whom the magician is identified; thus the food becomes the body and blood of the magician; whoever eats it is united with him and filled with love for him. He then repeats the following Egyptian ritual spell (DMP XV. iff) as the example of a close parallel to the Eucharistic practice. (One mingles various ingredients in a cup of wine and says over it) 'I am he of Abydos ... I am this figure of one drowned that testifieth by writing ... as to which the blood of Osiris bore witness ... when it was poured into the cup, this wine. Give it - blood of Osiris (that?) he (?) gave to Isis to make her feel love in her heart for him... give it, the blood of (the magician) (so and so, son of so and so) to (so and so, daughter of so and so) in this cup, this bowl of wine, today, to cause her to feel a love for him in her heart, the love that Isis felt for Osiris when she was seeking after him everywhere. Let (so and so, daughter of so and so) feel it, seeking after (so and so, son of so and so) everywhere... loving him, mad after him, inflamed by him, seeking him everywhere, there being a flame in her heart in her moment of not seeing him. Morton Smith may well be right in seeing a connection between the Eucharist and more ancient magical practices, but the important matter is the type of connection. Magic is simply the power of natural wisdom; it should have no supernatural connotation at all, except in so far as the rules, which govern it have not yet been understood. Once they have been understood the power becomes natural. In all actions, it is intent that is the paramount factor; and although the essential wisdom behind the Eucharist may be the same as that behind an arcane Egyptian rite, this does not bring the ceremonies to the same level. The surgeon's scalpel and the murderer's knife may perform similar actions - may even have the same end result - but we do not equate them, nor decry the former because of the baseness of the latter. The love sought by the supplicant in Morton Smith's magical rite was a lower level of love from that expressed by the disciples for Jesus, or by Jesus for his Heavenly Father. In the context of Yoga, Jesus' attitude to the Supreme was the yoga of love - Bakhti yoga. But, of course, Morton Smith's example may have been a later debasement of an Egyptian practice, of which the original intent was more spiritual. The high purpose of Jesus' life and death - indeed, of his mission - was to 'save'; to demonstrate to men how to live, and how to live more abundantly, in the service of the Supreme. Self- knowledge, self-discipline, kindness, love of the Supreme (his Heavenly Father), and of each other; and the development of inborn talents culminating in dedication of the self to its unique work in life; were the essence of his teaching. In following this course, Jesus came up against the adverse elements in the regime - family censure, condemnation by men of the world, loneliness and, ultimately, a painful and degrading death. But this communal stranglehold on the dispersion of Knowledge, must be transcended by the elite, if the full liberty of men is ever to be achieved - liberty which will be achieved through service; liberty seen as spiritual power in action for those who have eyes to see it; and liberty in the continuation of life after the death of the body through the application of his teaching. [MAT 13:15-16 JB VB] You will listen and listen again, but not understand, see and see again, but not perceive. For the heart of this nation has grown coarse, their ears are dull of hearing, and they have shut their eyes, for fear they should see with their eyes, hear with their ears, understand with their heart, and be converted and be healed by me. But happy are your eyes because they see, your ears because they hear! I tell you, solemnly, many prophets and holy men longed to see what you see, and never saw it; to hear what you hear, and never heard it. In this concept of 'seeing but not perceiving', and 'hearing but not understanding', there is much of the traditional wisdom of the Chinese tao. It has been one of the objectives of this book to attempt to pierce the veil that hides the secrets of mans past development, and to perceive a common truth where Christianity only sees 'through a glass, darkly', as Paul was aware (1 COR 13:12 KJ). The line of research that, in our view, gives the greatest hope of clarifying the 'glass: links Jesus with the blood-line of the Anannage and gives him a 'divinity' greater than any 'man before him. This blood-line is referred to in those Prophecies of Isaiah, which have been claimed to foreshadow the birth of Christ - but, even in this, the Old Testament record is far from clear. whom she will call Immanuel. It is difficult to see in this sign, or prophecy - by itself - any clear indication of the birth of Jesus which was still eight centuries ahead. Ahaz was King of Judah at the time of the schism between Judah and the other tribes of Israel, and was under military attack from King Razon of Aram and King Pekah of Israel - these were the kings who were terrifying Judah. As the Jerusalem Bible footnote (7h) points out, many interpreters of this passage identify the proferred 'sign' with the birth of the future king Hezekiah, son of Ahaz to whom we referred in the Coda of Chapter 9. That this was a rational explanation is shown by the fact that only the Greek version uses the term 'virgin' in place of the above 'maiden', which has been taken as one connection with the virgin birth of Jesus. The Hebraic text uses the term almah meaning either a 'young girl' or, equally possible, a 'young, recently married woman'. Such an expression could have referred to the daughter of King Ahaz - and the prophecy would have been sustained because, before Hezekiah was fully grown, the northern territories of Israel had been devastated by the Assyrians. The second argument of those who see in this 'sign' a connection with the birth of Jesus lies with the name Immanuel. This is usually translated as 'God with us' but, by itself, this epithet could have equally well referred to Hezekiah; it may have been a 'coronation name' as is mentioned by Pere de Vaux. Much of the desire to connect the 'sign' with Jesus rested on the hopes of Israel, which were invested in the Prophecy of Nathan. We give an extended extract of this because of the light it throws on a distant connection with the building of the Great House of Enlil at Kharsag. But, that very night the word of Yahweh came to Nathan: 'Go and tell my servant David, "Thus Yahweh speaks: Are you the man to build me a house to dwell in? I have never stayed in a house from the day I brought the Israelites out of Egypt until today, but have always lived a wanderer's life in a tent. In all my journeying with the whole people of Israel, did I say to any of the judges of Israel, whom I appointed as shepherds of Israel my people: Why have you not built me a house of cedar?' "
'This is what you must say to my servant David, "Yahweh Sabaoth says this: I took you from the pasture, from following the sheep, to be leader of my people Israel; I have been with you on all your expeditions; I have cut off all your enemies before you. I will give you fame as great as the fame of the greatest on earth. I will provide a place for my people Israel; I will plant them there and they shall dwell in that place and never be disturbed again... Yahweh will make you great; Yahweh will make you a House. It is difficult to Read into this promise of Yahweh's than an intention to keep the sovereignty of David's son, Solomon, intact for his lifetime. But David read far more into it than just that - we may not have the full text of what was said. In these terms, it may be that Yahweh promised to keep the House of David intact through all ages; and that this promise was given a further utterance in the virgin birth of Jesus to Mariam of Nazareth. There is considerable doubt over the meaning of Yhwh seba'oth; the title seems to stern from the sanctuary of Shiloh (1 SAM 1:3). In 1 SAM 4:4, Yahweh was first called 'Sabaoth who sits above the Cherubim. Enigmatic as this phrase has been considered to be, it may nevertheless serve to put the Yahweh of the time into perspective. In Chapter 6, we showed that the Cherubim were an order of the Shining Ones who were under the command of Gabriel; it follows that Yahweh's standing in the Anannage hierarchy (page 133) was above the Cherubim, and on the level of Gabriel. He is confirmed, therefore, as stated before, as one of the Council of the Anannage, under the authorities of Anu and Enlil. As such, he would have been party to the plans, which had been made for the advancement of Mankind; plans which seem to have stretched far into future generations. And he may have been responsible for establishing the line of David as a continuation of the blood-line of the ancient Patriarchs. This messianic revelation of Jesus, not merely as a wonder-child of seemingly miraculous birth, but as a king in his own right - of the royal line of David - may prove to be a substantial-link with (even a confimation of) the work of Michael Baigent, Richard Leigh and Henry Lincoln as set out in their controversial book The Holy Blood and the Holy Grail. These courageous and meticulous authors, after a remarkable corpus of research into modern, medieval and older documents, reached a startling conclusion... that there was definite evidence that Jesus may have been married, contrary to popular and ecclesiastical belief, and have produced a son; and that the blood- line may have been carried through the Merovingian kings of France as far as the present day. If they are right, the Anannage blood introduced into Adam, ten thousand years ago, may have survived, in a continuous line, and be destined to carry over into the third millennium AD. Mohammed, described as the last prophet, was born in Mecca, then a prosperous trading city of Southern Arabia, around the year 570 AD. His father, Abdullah, a member of the Quraysh tribe, died before he was born; and his mother, Aminah, died soon after while he was still young. He was an only child and was brought up, first by his grandfather!' and later by an uncle, Abu Talib. At the time of Mohammed's birth, Arabian worship was centered around sacred megaliths in a natural sanctuary of which the Quraysh tribe had the responsibility of guardianship. The tribe was not nomadic, but a trading community; and from the age of twelve Mohammed traveled with the caravans to Syria and back, gaining a great deal of experience of the ways of the Middle Eastern world, and coming into contact with both Jews and Christians of the trading fraternity. Mohammed himself was a striking man with a curious way of attracting and holding friends. By traditional descriptions, he had an intelligent face, piercing eyes, and a flowing beard; he had a good intellect and possessed unusual insight. His marriage to Khadija was a happy one, full of love and trust; but nevertheless, after some years he became restless. He wandered about, ate irregularly, became feverish and hollow-eyed, and looked wild and unkempt. This was not an unusual happening among the people of the area, and it was accepted that Mohammed had become a hanif. The description has points in common with John the Baptist. The first call to his mission was a voice saying, in Arabic, 'You are the Messenger of God' - a title applied, in earlier times, by the Anannage to Nusku and Enoch, and later adopted for Mercury. This sense of a 'supernatural' presence continued and, with it, the sense of destiny coupled with the fear of abandonment by the Power - the well-documented path of the mystic. He then saw these words printed in fiery letters on a spread-out cloth, and they became the first words to be written down as part of the Koran (The Recital), which was to become the Holy Book of Islam - Islam, itself, being the doctrine of submission to Allah, The Compassionate, the Merciful. When the writing had vanished, Mohammed stepped out into the open, and there saw the 'two great eyes' of the Being, and fled home to Khadija in terror. In the context of our study, this episode, and the Sura which accompanied it, contains much that is enlightening. Great eyes, shining (and we can assume that they were shining as it was night), were a characteristic of the Anannage/Angels, and whether this was Gabriel or another Anannage Principal is of little immediate importance - we know of no other Beings with this characteristic. Additionally, the Sura contains two statements, which place the Speaker firmly in the Anannage camp. The first is 'your Lord, the Creator, who created man from clots of blood: This is a direct confirmation of the Anannage method of creation referred to in Chapter 7, and elsewhere in this book. The second statement - 'your Lord is the Most Bountiful One, who by the pen has taught mankind things they did not know; ties right back to that evening in the Great House of Enlil (the Lord of Spirits) when Uriel was instructed to produce books and a pen for Enoch to record the wisdom of the Anannage. Despite his terror of the experience, Mohammed maintained his trust and confidence in his revelations; and, afterwards in the wilderness, more words were shown to him, and other revelations were repeated at intervals. These were always spoken by 'the Lord', usually in the first person plural, indicating that these revelations were a collective responsibility of the Shining Ones, and not the whim of a single personality. This is in keeping with the early statements in Genesis; on the other hand, Yahweh, when speaking, invariably used the first or third person singular. [KOR: Man VB] Does there not pass over a man a space of time when his life is blank? We have created man from the union of two sexes so that We may put him to the proof. We have endowed him with sight and hearing and, be he thankful or oblivious of Our favours, We have shown him the right path. For the followers of Islam, announcements like the one above are now the undoubted words of God, and Mohammed truly believed that he was a Messenger of God sent out to confirm previous teachings, and to bring people back to the true religion of Abraham. His chief duty was to warn. [KOR: Introduction VB] The Koran preaches the oneness of God and emphasises divine mercy and forgiveness. God is almighty and all-knowing, and though compassionate towards His creatures He is stern in retribution. He enjoins justice and fair dealing, kindness to widows and orphans, and charity to the poor. The most important duties of the Muslims are faith in Allah and His apostle, prayer, fasting, and pilgrimage to the Sacred House at Mecca, built by Abraham for the worship of the One God. The Allah of Mohammed, whose name is apparently cognate with el and ellu, the Shining One, was a fiercely dominating character whose will had to be obeyed - there is, in the Koran message, an overwhelming sense of his majesty, and commanding powers of disposal. Muslims use a rosary of ninety-nine beads to assist them in the recitation of his 'beautiful' names (reminiscent of the one hundred names of Marduk, in Babylonia); a rosary, which is comparable with the girdle of a hundred and one beads used by Zoroastrians. For the Muslim, religion is mainly revelation, unequivocally accepted, and complete obedience to the will of Allah. Love, as adoration, is not a noticeable part of his attitude, although submission can be an indication of it, and faith is certainly a form of love. At first, the sect of Mohammed was a small one. In time, he preached more boldly against the cults of Mecca and found himself up against the leaders of the city, and the guardians of the megaliths. His followers (Companions) were dispersed, and he was forced to recant. After a time, he managed to re-group in the oasis-city of Medina; he made a shrewd peace with the old religion, and proceeded to extend his ideology by the use of the lehad - 'holy war'. Despite involving his countrymen in war, Mohammed brought a breath of fresh air to the beliefs and practices of Arabia. He managed to abolish infanticide and cruelty to animals (a feature of Zoroaster's teaching), and prohibited the drinking of alcohol. His aim was to reform society, and his ideal was a universal Empire and a universal Faith - 'One Prophet, one Faith, for all the World'. In all this, his object does not seem to have been self-seeking; he behaved very simply and was essentially puritan in outlook. He regarded himself as only the messenger of Allah; he did not perform miracles nor become transfigured, and has never been worshipped. Islam is the worship of Allah, or ar-Rahman, the Beneficent. It was during this bitter time that Mohammed reported an extra-ordinary experience, which had come to him in the night. He had been taken out of his body in spirit by the angel Gabriel and had met spirits of the great Prophets of old - Adam, Abraham, Moses, Jesus and others - in the invisible world of the angels. He had also been shown how the destiny of the world is written down. It is impossible to comment on such a seemingly improbable statement; the possible interpretations are many, and in the absence of other evidence, each is as probable as another. Nevertheless, we must not overlook that the New Testament reports a similar experience for Jesus. [LK 9:28-31 JB VB] Now about eight days after this had been said, he took with him Peter and John, and James and went up the mountain to pray. As he prayed, the aspect of his face changed and his clothing became as brilliant as lightning. Suddenly, there were two men there talking to him; they were Moses and Elijah appearing in glory, and they were speaking of his passing which he was to accomplish in Jerusalem. 5. Hadj, or pilgrimage to Mecca. 6. Jehad, or the Holy War. Islam does not believe in any mediation between man and his Maker 'who knew him before he was born and is closer to him than his jugular vein'. The worshippers do not uncover their heads, but remove their shoes or sandals, and perform certain ceremonial ablutions, and then line up in a row facing towards Mecca, the leader taking up a position a little in front of them in the centre. This is similar to the formal yogic meeting of a class for instruction; and it should be said, too, that any good-living Muslim can lead the prayers in the Mosque on Fridays although, usually, a scholar called an Imam does this. An individual who prays at the stated time during his ordinary day's work will spread his prayer-mat and then go through the same devotions alone. The stated times are sunrise, midday, mid-afternoon, sunset and bed-time. 1. Upright with the palms raised, to the level of the ears. 2. Still standing, the arms are lowered, and the right hand placed over the left one (this is the posture of the Anannage figures shown in Plate 7. Only one has his left hand over the right, and that is the odd man out - the 'scribe'). 3. The body is bent forward at right angles and the hands placed on the knees. 4. The standing position is resumed. 5. Kneeling, supported with the hands on the ground, palms downwards, the body is bowed forward till the forehead touches the ground. 6. Sitting kneeling with the hands resting on the knees. 7. and 8. are repetitions of 5. and 6. Islam was taken to India very soon after its foundation in Arabia, and could have absorbed yoga practices there. The movements show an intelligence in keeping the body healthy and the spirit perceptive, raising the level of individual consciousness; and the whole concept closely parallels Zoroaster's insistence on a strong body in building spiritual maturity. Finally, it should be stressed that Islamic prayers are not petitionary but show submission to the will of Allah. It should be remembered that the very nature of this complete bowing to an inscrutable Divine WilI occludes any possibility of petitionary action; any request of Allah can only be for forgiveness and guidance. In this complete submission to the Divine Will, and in the fiercely dominating character of Allah with its sense of majesty and arbitrary disposal of the affairs of men, there is much that brings to mind the relationship of the Israelites with Yahweh in the desert. If Allah appears to be more compassionate than Yahweh, may it not be that Muslims have accepted submission whereas the Israelites were a 'stiff-necked people'? Through Ishmael, the son of Abraham by Hagar (Sarai's Egyptian maidservant), the Arabs are a branch off the Patriarchal tree, and presumably carry the same racial memories of El Shaddai as the Israelites themselves. One of Ishmael's sons, Haddad, was named after him. They have as much interest, therefore, in the original Covenant between Abraham and El Shaddai as has the modem Israeli nation; but, not being on the main stem, they had no part in the 'Consolation' of the latter Yahweh' of the time of the Jewish exile; nor in the 'Loving Father' precepts of the teaching of Jesus. The Persians however, were influenced by the latter Yahweh: even being moved to release the Jews from Babylon at his persuasion. The consequence seems to have been that the Zoroastrianism of Persia, the Christianity of Palestine - and even the later Jewish faith - are 'soft' religions with emphasis on the loving nature of God; but the Islam of Arabia remains a hard' religion taking its nature from its relationship with the 'earlier Yahweh'. It is not surprising, therefore, to find the jehad - the Holy War' - an intrinsic part of that religion; the Yahweh of Moses's time would have strongly approved. The will to believe dwells in the very blood corpuscles of the Eastern man, and he cannot get rid of it, try as he may. The italics are ours; the unconscious truth, in metaphor, is Brunton's. The object of Muslim prayer is not only to show dutiful action towards Allah, but also to achieve spiritual education through that action and, in searching for the truth, to obtain it through logical reasoning. Blind imitation is considered wrong and harmful. Always he reminded his followers that he was a man, like them, and warned them not to worship mere graves. Zoroaster left his followers with the Avesta and similar admonitions, over a thousand years earlier.